Relax in turn-of-the century surroundings which combine the finest in deep south hospitality, warmth, and elegance with the conveniences and personal service of a first class hotel. 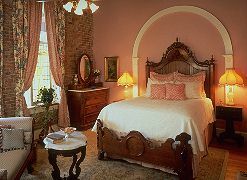 The fourteen guest rooms, each exquisitely furnished in American antiques, have private bathrooms, telephones, and individual climate control. Rock in chairs on the back balcony overlooking the courtyard or enjoy some of the many shops, restaurants, and night spots in the adjacent Ant Street area. Whether it's business or pleasure that brings you to Brenham, the Ant Street Inn will offer you a nineteenth century retreat for the twentieth century traveler. Rates: from $115.00 to $235.00 plus tax. Breakfast included. No smoking inside, please. 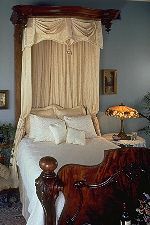 This and other Brenham Bed and Breakfast Inns can be found here in The Register.